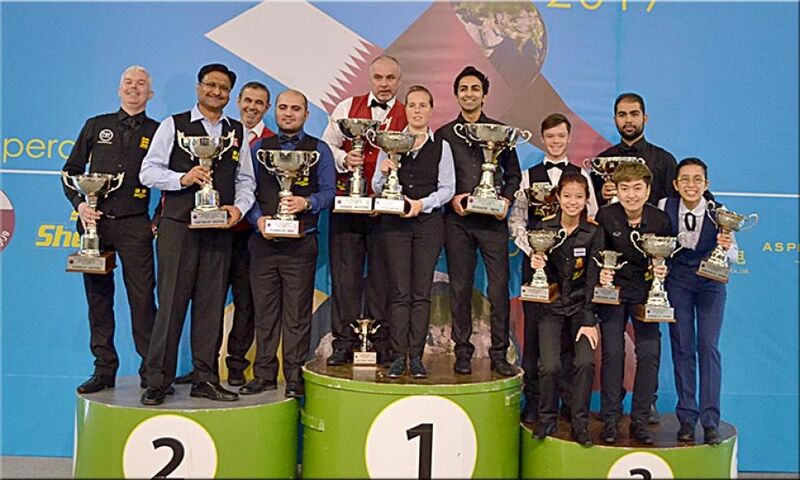 2017 IBSF Snooker World Championship concluded today at Al Arabi Sports Club in Doha, Qatar. Pankaj Advani from India beaten Amir Sarkhosh of Iran in almost one-sided affair 8-2 to claim his third World Snooker and overall 18th World title. After last night’s challenging semi-final, it was comparatively an easy walk for Advani. Initially it appeared that match will have a close finish when Sarkhosh started by winning the opening frame, but as the match progresses, he committed errors at times. On the other-side, Advani was calm and composed. Soon he was leading 4-1. In 6th frame, Sarkhosh made a comeback with break of 134. But that was his last attempt as Advani, thereon, secured remaining frames to claim the title. In Masters category, Darren Morgan becomes champion again after a gap of 5 years. His last victory in Masters category was in 2012. Today he defeated Englishman Aidan Owens 6-3. During the match, Darren made five breaks (44, 55, 112, 83 and 58) to knockout Owens. The title run for Wendy Jans from Belgium continues as she secured her 6th consecutive world women title to make it overall 7 titles of her career. Wendy opened her account in final with two breaks of 40 points to lead 2-nil. The match became slightly tricky when her opponent, Waratthanun Sukritthanes of Thailand made a remarkable comeback by sending contribution of 59, 38 and 37 and levelled the match. In that alarming situation for Wendy as she entirely dominated thereon to secure remaining frames and won the title 6th time in row.